Although you'll find genetically modified organisms in about three quarters of all processed food, there are only a handful of whole fruits and vegetables raw foodists would consider ideal which have been tampered with genetically and successfully brought to market. 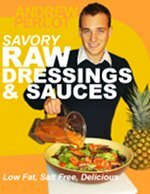 In this article I'll go over why you should be wary of GMO foods, which fruits and vegetables have been modified in a lab and are now for sale, the myths about identifying them at the supermarket, and the only surefire ways at your disposal for figuring out which foods are safe for consumption on a raw diet. Genetically modified fruits and vegetables are now in more than 70% of the foods you can buy at the supermarket, but surprisingly, there's virtually no research that shows they're safe for human consumption. Immune system disfunction in mice fed GMO soybeans and corn, including disfunction known to result in asthma, allergies, and inflammation (1, 2). GMO foods appear to change the function and even the structure of an animal's liver, alters the way the their bodies metabolize fats and carbohydrates, and makes cellular changes which could lead to an increased rate of aging (3, 4, 5). Mice fed GMO corn give birth to fewer offspring, and have lower litter weights compared to those fed non GMO corn (4). Animals consuming GMO foods have altered function in their pancreas, spleen, and kidneys (1, 4, 5). Intestinal damage and disruption of the intestinal immune system occurs in animals fed GMO foods (1). Although we have no significant human studies to draw on, these finding are alarming enough that no one should be eating GMOs without lots of further study of humans consuming each individual GMO food over long periods of time. At the end of the day, most genetically modified fruits and vegetables end up in processed foods or as feed for animals. As of 2012, most soybeans ( 94% of the US crop), non-sweet corn (88% of the US crop), and sugar beets used for processed sweeteners (95% of the US crop), are genetically modified. But raw foodists have it easy as of 2013. There are only a few big crops you have to worry about. Please note that we're only talking about food that's approved for sale to consumers. Other GMO crops have been developed and are undergoing testing or review, but have not been approved for consumption. Others have been approved for animal feed, so only those consuming meat and animal by-products need to worry about them. There is currently only one (culinary, as opposed to botanical classification) GMO fruit available in US supermarkets today. GMO Hawaiian papayas have been on the market since the late 1990s. Roughly 80% of of the state's papaya production is now devoted to two GMO varieties designed to resist papaya ringspot virus. 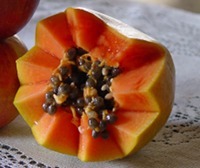 These small papayas, often labeled "Hawaiian Papaya" in grocery stores, are easily compared to the much larger type, often labeled, "Mexican Papayas," which are not genetically modified in any way. The later come from Mexico, the Caribbean, and other parts of South and Central America. I've got some bad news for you spiralizing aficionado: much of the zucchini and squash available on the market today is genetically modified. 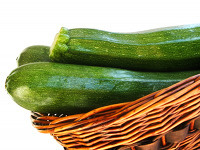 In 2012, more than 25,000 acres of a type of straight neck yellow squash, and two varieties of zucchini were planted. It's no longer safe to assume that even sweet corn, the summer joy of millions of Americans, is free from genetic modification. There's few things I enjoy more than chowing down on raw, freshly-picked sweet corn, so this breaks my heart. GMO sweet corn started appearing in grocery stores in the summer of 2012, and that year GMO plantings accounted for 40% of the US acreage. 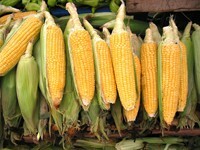 The GMO share of the market is expected to increase in the years to come. GMO Foods: But What About Tomatoes? Because I know people will ask about it, I'll just quickly mention that no GMO tomatoes are being sold in North American supermarkets as of 2013, and that's unlikely to change in the near future. . Although they were approved for sale in 1994, the GMO "Flavr Savr," tomatoes held up to shipping so poorly and tasted so badly that consumers didn't buy many, and grocery stores stopped carrying them. They were completely out of circulation by 1997, and have not come back. What About Cross Contamination of Species? One problem is that when GMO crops are grown, they can contaminate fields that are miles away via pollination or seed dispersal. Even when a farmer sets out to grow organic, GMO-free crops, he can be foiled by this process. What this means is that a few other types of vegetables are sometimes contaminated with GM DNA. The source of this contamination is pollen and seeds sourced from GMO test fields. The following species are the crops a raw foodist would be concerned with, which fall into this "minor risk" category. But Can't I Just Identify GMO Foods Via The PLU Code? Magazines articles, facebook postings, and blogs created by people who haven't bothered to do any research have convinced large segments of the public that it's possible to identify GMO foods via the Produce Lookup Code that can be found on produce, or on the box that it came in. This is not the case. PLUs are not regulated by a body with any authority over retailers or growers. The Produce Marketing Association, which manges the PLUs, is an NGO funded by retailers and growers, and is entirely self regulating. Their system of five-digit numbers and barcodes gives retailers the ability to electronically check on produce varieties, but only gives the information the grower wants to give. The PMA has optionally given retailers the right to use the the number 8 as the first number of codes identifying GM produce. It does not force them to do so. If you check through the aprox 1,500 PLU codes registered with the PMA, you'll note that not a single retailer has bothered to register a code beginning with the number 8. Why? Most likely because it's not in their interest for anyone to know if a food is GM. Even if some sellers agree to use the 8, there's no guarantee everyone will. You can't be entirely sure that what you're eating is entirely free of GM material because of the rampant cross-contamination mentioned above. However, the risk from that is considered relatively minor. You can be reasonably sure a piece of produce is GMO free if it is certified organic, because certified organic growers cannot use GMO seeds. Although new species will likely come on the market in the future, There are only really three main species a raw foodist has to worry about as of 2013. In most cases, simply buying your Hawaiian Papayas certified organic (or going with the larger conventional Mexican Papayas), and buying your sweet corn, zucchini, and squash certified organic will ensure that you avoid GM foods. 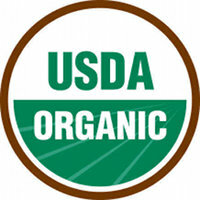 Although the organic vs nonorganic produce debate is worthy of consideration by itself, from the perspective of GMO avoidance alone, there's no compelling reason why you need to get certified organic produce for other foods besides these three if you're eating a healthy raw food diet. See how GMO foods compare with the health hazard of pesticides and fertilizers. Learn what foods are healthy, and which you should avoid. 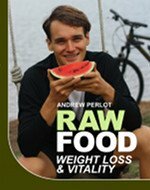 Get on a raw food diet that will change your life. 1) Finamore A, Roselli M, Britti S, et al. Intestinal and peripheral immune response to MON 810 maize ingestion in weaning and old mice. J Agric. Food Chem. 2008; 56(23):11533-11539. 2) Kroghsbo S, Madsen C, Poulsen M, et al. Immunotoxicological studies of genetically modified rice expression PHA-E lectin or Bt toxin in Wistar rats. Toxicology. 2008; 245:24-34. 3) Malatesta M, Boraldi F, Annovi G, et al. A long-term study on female mice fed on a genetically modified soybean:effects on liver ageing. Histochem Cell Biol. 2008; 130:967-977. 4) Velimirov A, Binter C, Zentek J. Biological effects of transgenic maize NK603xMON810 fed in long term reproduction studies in mice. Report-Federal Ministry of Health, Family and Youth. 2008. 5) Kilic A, Aday M. A three generational study with genetically modified Bt corn in rats: biochemical and histopathological investigation. Food Chem. Toxicol. 2008; 46(3):1164-1170.